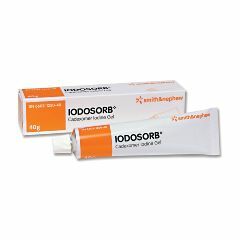 Iodosorb Gel is the only wound gel that inhibits bacterial growth as it absorbs exudate. Specially formulated for use on wet, exudating ulcers, diabetic and venous ulcers, pressure sores and infected wounds. As absorption occurs, the cadexomer releases iodine, which reduces the bacterial load without affecting granulating tissue. As the gel absorbs exudate, iodine is released, killing bacteria and changing color as the iodine is used up. Effective. Promotes Healing. Safe. Easy To Use. I apply this to Durafiber and apply to wound and cover with Hypafix tape. Wound is healing faster than ever. Safe. Easy To Use. Promotes Healing. Haven't used the product long enough to see how it actually works on my serious leg ulcer. I seems to contain the exudate better than anything I have ever used in 5 years. Also I have a feeling it will promote healing if used long enough. Don't know how effective. Easy To Use. Particular problem. Long Term Use. Keep In The Medicine Cabinet. Experienced in wound care. My own wounds. So far it has not caused any problems. I do not know how well it is working yet. Keep In The Medicine Cabinet. Emergency Preparedness. My own wounds. Experienced in wound care. CPR Trained. care giver. Great product to have in medicine cabinet or portable med bag. What is the best way to treat the wound with this product does it need covered with a dressing. And wil it scab over if covered? I put a good-sized blob of it on non-stick sterile dressing, and plop it over the wound. I try not to disturb it for two days or so -- it turns white, then repeat as needed. It really helps keep the exudate down, and the skin will scab over nicely with it. The only way you wouldn't put a dressing on would be if the area is covered with skin or scab and you are just trying to prevent reinfection. But then you run the risk of staining your clothes. Because it is to prevent/treat infections, covering it is the best thing to do. Either let the iodoform dry on the skin then put on a telfa, or (if the wound is moist), put the iodoform on the telfa itself, then apply. I HAVE A PRESSURE SORE ON THE VERY TOP OF MY LEG. tHIS PRODUCTS SOUNDS HOPEFUL BUT EVERTHING WE PUT ON IT COMES OFF WHEN I USE THE RESTROOM OR JUST SIT DOWN. aNY SUGGESTIONS ON HOW i CAN USE THIS WITHOUT IT COMING RIGHT OFF? REALLY APPECIATE SOME HELP ON THIS. THESE THINGS REALLY HURT!!!! It would have to be covered with a bandage to keep it from coming off. Use skin prep or benzoin on the skin to help the bandage stick better and avoiding ripping the sin off with the bandage.If you have trouble soiling the bandage, I would recommend tegaderm, or a generic tegaderm. - This is the bandage that looks like it is just saran wrap, but it sticks well. The directions say don't put any medicine under the tegaderm, but if you let the iodoform dry before putting on the tegaderm, it will work well. Where can I buy this product, do I need a scrip? Do you need a prescription from the dr to buy this at the drug store? Asked on Oct 9, 2011 12:36:58 PM by Butch from Dodson,LA. U.S.A. I'm confused by the directions on the tube. Do you put this stuff into the would or on top of the would so that it pulls the bad stuff out? My wound care doctor put the gel on the absorbent bandage and then applied it to the wound. He and his staff directed me to do the same since the wound itself is often very moist and the gel won't stay where placed. You can put the iodoform directly on the wound if the wound is very dry. Wait for the iodoform to dry completely, then cover with a bandage.